Most games occupy a sector of about 50% in the love-hate-axis: there are games that some people love and others can take or leave. There are games that some people hate and others don’t care about either way. And of course there are games that some find kind of good and others find kind of bad. Robo Rally manages the rare feat of only occupying both extremes: people love it or hate it, I literally never met anyone that fell in the take it or leave it range on this one. This is another game that might as well have gone into Nostalgia, but once again I’ll have to draw the solipsism card. I played it for the first time only a few years ago, so I don’t feel nostalgic about it. The first edition was published in 1994 by Wizards of the Coast and designed by Richard Garfield. For those keeping track, that’s only one year after he created Magic: The Gathering – it was actually designed in the 80s, but apparently only published after Richard had proven his genius, anyway it turned out to be another big success, a game still in print 17 years later. Looking at the first edition, I just discovered that the art for this first edition, especially the metal robeeple (that’s robot meeple – yes, I realise that one is a bit of a stretch) were done by Phil Foglio who later created one of my favourite online comics together with his wife Kaja: Girl Genius. It seems I can still be surprised. The premise for Robo Rally is as silly as it is disconcerting. Imagine you’re a super computer running a factory. Running the factory doesn’t even begin to engage your mental capabilities. Brain the size of a planet and all that. So you and the other supercomputers from the I’m-a-bored-computer forum devised a way to pass the time: a robot race! And because you have these huge orbital factories under your control with all kinds of machinery installed – conveyor belts, lasers and other toys – you might as well use those and make it an obstacle race. So you set up a race track with start, finish and some check points in between and invite all your supercomputer buddies over to play. As befits a supercomputer with a brain the size of a planet, you don’t control your robots directly, that would be too boring. Instead, you program them. 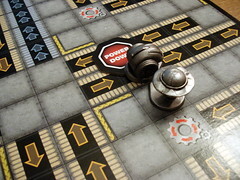 Where most racing games rely on dice for the racing part, Robo Rally has a set of programming cards with seven different types of instructions: go one, two or three steps forward, one step backwards, turn left, right or do a U-turn. With an undamaged robot, you’ll have nine cards for your turn and use five of those to create your program for this round. This program is then mercilessly executed, even and especially if something goes horribly wrong in the middle of it. Putting five cards in the right order to move forward doesn’t sound so challenging that something going wrong is likely, but that’s only until you consider conveyor belts that move you along, cogs that turn you or pushers that move you sideways. All these devices activate after every step and suddenly keeping track of where you’re going is not so easy any more. Puzzle of the month: where will Hulk end his turn? We'll give a big "Well done!" to all right solutions. Programs are executed step by step and in parallel for all the robots: first all robots execute their first card, then the second and so on. Within each step, the cards have numbers on them to determine their priority: faster movements have higher numbers and higher numbers are executed first. Why is order of execution important? Because robots don’t have any scruples about collisions and enough horse-powers to push their competitors around: when you’re moving and another robot is standing in the way, you push him along without even slowing down – for this robot, moving before you may make the difference between ending the turn on the safety of a checkpoint or at the bottom of a bottomless pit you pushed him into and being forced to activate a backup at the last checkpoint. And even if he survives your push he is still forced to execute the rest of the program. That one little push can make him end up half a game board away from where he wanted to be. Pushing is not the only way to lose friends in Robo Rally: your robots also fire their lasers after every step and whoever is standing straight ahead of them takes a point of damage. Nine points of damage and it’s backup restoration time. But even before that, taking damage is a bad thing: for each point of damage you receive one less card to write your program. Of course, that means that with more than four points of damage you’ll have to little cards to write a complete program. Does that mean you can just write shorter programs then? You wish! 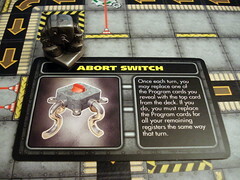 Any damage beyond four points burns in one instruction at the end of your program: the card remains there after the turn and is executed every turn from then on. If you thought navigating between three conveyor belts going in different directions was hard, try doing it in a way that a burned it Turn Left and Move Three at the end don’t kill you. Fortunately, damage is not forever. Some fields on the board allow you to repair when you end your turn there and if that fails, you still have the option to power down: spend one whole turn without taking any actions and all your damage is repaired. 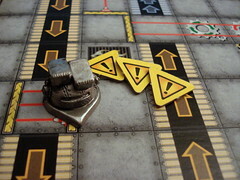 The only downside of this is that you have to announce your downtime at the beginning of your turn one turn in advance – so you’re not exactly certain where you will end this turn, and it’s highly amusing for everyone else when you realise you will power down on a conveyor leading straight to the pit. Finally, there is one more thing making Robo Rally even more chaotic: upgrades. Some repair fields have the additional option of drawing an upgrade card. Upgrades are very diverse in what they can do and how strongly they affect the game. The ability to move sideways instead of turning and then moving forwards is incredibly useful, but only in a very small set of situations. Remote controlling another robot and forcing your program on him instead of hitting him with your laser is much more powerful and entertaining. There’s plenty to love, about Robo Rally, especially for me as it’s one of the very few games where skills from my day job – creating software – actually come in handy. The variability of the game is an upside for everyone: you assemble a different board every time and placing the check points lets you create a wide variety of race tracks. There are more variants beyond that, the manual presents a team-based capture-the-flag variant, for example. And of course I – and many others – love the utter chaos that can ensue from just one misplaced instruction or one well-timed push. Who wouldn’t like that kind of game, then? There seems to be a whole lot of people that dislike Robo Rally only because they had a badly set up first game. I fell into that trap a few times myself. I think: okay, lets make this interesting, take four boards and create a track that crosses itself often so people will run into each other. WRONG! That kind of game will probably take more than five hours to play and more than likely be won by the last guy to have backups left. I know a bunch of people that had this kind of game as their introduction to Robo Rally and never wanted to play again. So be smart, use no more than two boards when introducing new players. 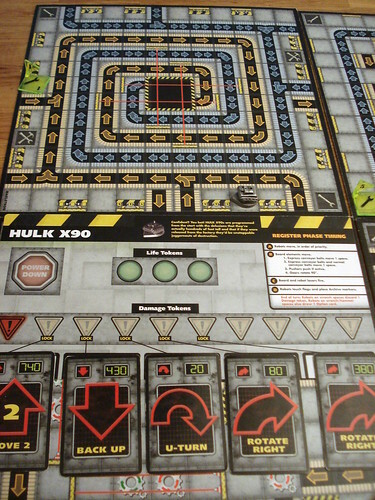 Also, everyone having trouble solving the rotate-this-shape sort of tests in most IQ tests may not like Robo Rally – if you can’t predict which way your robot is facing after three turn instructions, a cog wheel and two corners on conveyor belts, this game can become a very frustrating experience indeed. Corners on conveyor belts, by the way, are the most confusing part of Robo Rally, even otherwise brilliant players can sometimes have problems with them, so here’s a public service announcement to try and clear that up: when you’re moving under your own power, you’re never turned by the conveyors. When you’re transported by the conveyors you follow the arrow on the corner – turn 90° – when you are moved onto the field and you are not turned when moved away from the corner field. I hope this clarification can save some people a headache. So, what is my recommendation on Robo Rally? I’d recommend that everyone should have at least one, maybe more if you count programmers among your friends. When introducing it to other friends and family, keep the warning about game length in mind: not everyone enjoys multiple hours of racing and a bad experience to start might burn a player who would otherwise want to play again next week.